We’ve been living in the same house for 10 years and it’s on a very busy cut-through street. Someday we’ll move, but we like our neighborhood and aren’t in a hurry. But one drawback of living on a busy street, aside from the potential to be run-over when crossing it, is we don’t get many trick-or-treaters. Last year was the worst. We bought bags and bags of good chocolate candy and didn’t get one single child — not even a 19 year old hobo or the preschooler across the street. So this year for the first time ever, we turned off the porch light and both went trick-or treating with Fuzz. It turns out all the fun is on the back streets, where people gathered in driveways with buckets of candy and portable TVs for watching the UT game. Trick-or-Treating was more fun than passing out candy, but this morning I’m still feeling a little guilty for leaving the light off. I could have at least put a bucket of candy out with a little sign saying “Take 2”. Here’s a picture of the 6 pound 5 oz candy haul. Look at all the chocolate! Yet another reason I like our neighborhood. One house even gave out snow globes. I hope you had a fun Halloween too. Only 364 days left until the next one! Monster Rice Krispy Treats Etc. I am so jealous…I don’t know where you live – but we are in Missouri where the costumes have to be big enough to wear coats under them…. I love all your cookies…thank you for listing them all in one place. I made the Chocolate malt ones last night and my little girl thinks I’m a genius! We never get any trick-or-treaters either since we live in a gated community, which is sad :(. So this year, my wife and I decided to both go trick or treating with our 1 and 3 year olds. It was a lot more fun than manning the door :). Looks like Fuzz had a lot of fun, nice! Wow! Candy overload! I love Fuzzs’ costume! She looks adorable. Halloween is definitely more fun when you have little ones to walk around the neighborhood. Those days are gone for us now. Fuzz says thanks for the costume compliments, and I’m enjoying the trick-or-treat stories. I can’t believe someone dressed as a wedding cake. How creative. Cindy, I saw that. They’re paying kids for candy and sending it to the soldiers. That’s kind of neat, but the last time I talked to a soldier she said they had a TON of candy already. Then again, she wasn’t complaining ;). It’s a pretty good idea, actually. Gloria, Fuzz got her nickname when she was a baby. She had very wispy hair that fluffed up on her head like a ball of Fuzz. That is one cute Fuzz leopard!! She definitely has the photogenic genes! That Halloween snow globe is a hoot and healthier than candy to boot!! We had two door bell rings…maybe 20 kids tops. My husband way over-bought on candy and I’ve had snickers and almond joy dinners for two nights. Argh!!!! 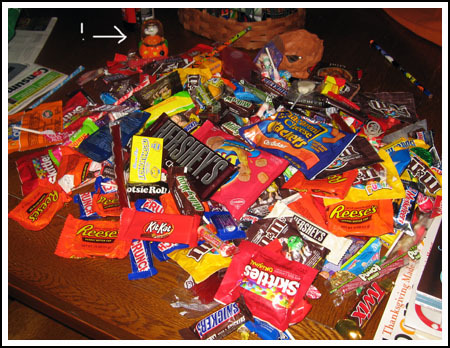 My nephew had a pillow case more than half full with candy-some were even FULL SIZE bars..I couldn’t believe it. Off the subject of candy, but how did Fuzz get the name Fuzz? Just heard a piece on the local news about a dental organization (I think it was Healthy Smiles, not positive) who were paying a dollar a pound for Halloween candy and were sending what they collected to the troops. Tried to find it on the internet, no luck. We didn’t get a lot of Trick or treaters either. We never do and I always over estimate the amount of candy we’ll need. We live in an older subdivision that is right behind a newer subdivision with much larger houses. Everyone on our street just goes there because they’ve got the “good loot.” It’s too bad because I miss seeing all the neat costumes. candy! I don’t know how he did it…but, man he worked those houses!! What a darling leopard girl and what an impressive haul. We only got a handful of kids last night. One was dressed as a wedding cake! What a cute costume. And Fuzz seems delighted to wear it and have her picture taken. It’s no wonder she came home with such a haul of candy. We don’t get any trick-or-treaters on our street either, except the few kids who live on the street, yet one street away as well as up the hill they get TONS! For some reason they don’t come to ours (which is the first street in the neighborhood). Our church has a trunk-or-treat, which is nice to get most of it done in a parking lot and we still give out LOTS of candy. Then we go out around the neighborhood at bit after that. Wow, the loot! I was curious, so I just went and weighed Parker’s pumpkin bucket, which is stuffed to the very top (why is one always more full than another kid’s when they went to the same places?) Anyway, Parker’s bucket full was only 3.5 lbs! And I’m already tired of the issues with candy. In fact, Scott and Taylor’s is taken away for the day for fighting. Sigh! Ahhh, the joys of Halloween! Glad you got to go, too, this time! Thanks for posting the picture of Fuzz! She’s so cute, and looking more and more like you as she gets older. There weren’t any pink leopard’s here last night!! 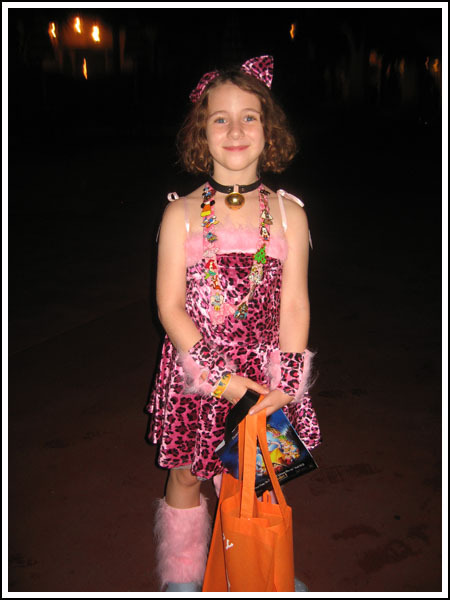 I love the leopard costume–that is one thing I have never seen in all of my Halloweens,:a pink leopard! How clever! When I have had to work on Halloween, I usually put out a bowl with little bags and a sign. It seems to work, and the worst that could happen would be that someone would take them all–I’m not that fussed about the loss of candy. And people never have. This year, I gave out Reeces peanut butter pumpkins, 3 Musketeers (mint), and white chocolate Kit-Kats–I only have 10 candies left! You were right to go out, though–I miss trick-or-treating and those years are really precious. So cute and Fuzz is looking so grown up! Wow! That’s quite a haul! We had one of the best years ever for trick or treaters, not necessarily numbers wise, but fun, cuteness, and politeness wise. There were a lot of really cute kids in their Halloween costumes along with quite a few parents who were also in costume. The teenagers that we had were in fun costumes and seemed to be having a ball, while minding their manners. Fun times. The best part? We ran out of candy. We couldn’t be happier! No doubt Fuzz will share her bounty with you for some some fun baking projects. We miss trick or treaters! Our community had Halloween yesterday MORNING! Didn’t seem right! When I lived in the San Francisco Bay Area, I had just the opposite. I lived on a corner and there were several apartment buildings nearby so we were swamped with kids and always ran out of candy! I can’t wait to see what creative goodies you put together using some of your Halloween haul!